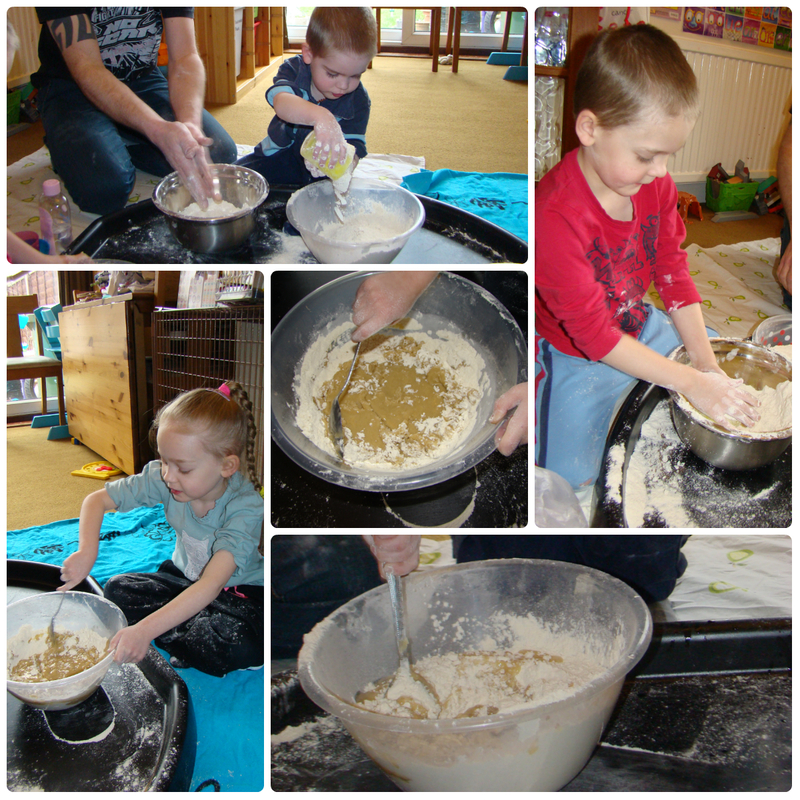 We have been enjoying messy play in our Tuff Spot again today. We made Moon Sand! Moon Sand is a mouldable sand that you can build with and crumble up over and over again. I have also seen it called Cloud Dough. You can buy branded Moon Sand (and we have had this before) but somehow this home made version is so much nicer to play with. And, the best part, it is so very simple to make! You need just 2 ingredients.. flour and baby oil. I have seen a few variations on the recipe but I went with a 5:1 flour to oil ratio, simply to make the flour go a little bit further! The kids did their own measuring and mixing, 5 cups of flour and 1 cup of oil each (actually I did help measure the oil out!) and then mix together well. Then we tipped it all out into the Tuff Spot and got stuck in! I put some cars and diggers in with the sand, some feathers and pompoms, some star-shaped bun cases and some knives and spoons. I also added in some plastic Easter egg moulds that I picked up from the 99p shop but never got round to using for anything! Towards the end of the play Ben asked for some trains to be added so we put 2 engines and Bertie the Bus in as well. Jasmine immediately started playing with the feathers and pompoms. She made sandcastles and cakes and decorated them. She made a large Easter Egg from the plastic mould. Next she got a bowl and started adding “ingredients” and stirring them together to make another cake. She used the last remaining drops of baby oil in her cake as well! When the engines were added in she used one to make tracks in the shapes of letters and she made c, o, y, g and n.
Thomas started off by building sandcastles and playing with the diggers. He also made a few cakes and Easter Eggs but he quite liked making them and them crumbling them again to rebuild. He built piles of Moon Sand and cut them up with a knife, and this turned into a game of hunting for treasure. He would hide something inside a sandcastle and then dig it out again with his fingers, or scrape the sand away carefully with the knife until he had found his “treasure”. He played this for a long time, hiding treasure for us all and asking us to hide some for him. Ben loved the sand! He mostly played with the cars and diggers, driving them round and round or burying them and digging them out again. He used the diggers to move sand around. He also enjoyed burying the feathers and pompoms! He made a couple of sandcastles and really enjoyed Thomas’ game of buried treasure. He had a go at burying his own but mostly wanted someone else to bury it so he could dig (or smash!) it out. He watched Gordon build a wall out of the sand and had a go himself. The Moon Sand was a very successful activity and kept all the kids occupied for a very long time. We have also managed to keep most of the sand we made so will be getting it out again in the next day or so to play with some more. I have a few more ideas about what to include or add in to the play, including adding glitter to the sand, or burying some dinosaur bones (from a make-your-own dinosaur skeleton we have) to be dug up and built into the dinosaur. The possibilities are endless with this and I also have a lot of ideas about what I want to try with fresh batches of the sand as well, like adding food colouring to the mixture for different colours, or adding lavender or similar for different scents. What would you do? I’d love to hear more ideas. Think we need to do this at home ed group soon! Yes, I love my Tuff Spot.. I think everyone should have one!! We’ve not got any pots big enough to keep all the sand in at the moment (we did make rather a lot!) so I think I’m going to have to go and buy some today.. thanks for the foil tip! great idea, have made a note t do this with my kids! will probably try food colouring. thanks for sharing. i had a thought looking at your lovely photo’s we have some sea shells from our great yarmouth holiday last year )which we painted, then varnished and covered in glitter!) i think they would be great in the moon sand too. also, definitely going to get a Tuff Spot. exellent idea. removing my 3 year old from nursery school after easter, so i’m just getting started. think i need to save up for a laminator too! And yes, a laminator is another thing I find invaluable! In fact, that has just reminded me I need to get some more laminating pouches! I’ve been enjoying your blog and love the way you use your ‘tuff spot’. Where did you get it from? You can also get them from Amazon and places like B&Q, although B&Q are more expensive. Thanks! I’m off to buy one – they look so adaptable!